Animated series. Astrid comes down with the scourge of Odin and the Riders must search for the cure by finding a nearly extinct buffalord dragon before Viggo does. Browse content similar to Buffalord Soldier. Check below for episodes and series from the same categories and more! Yeah, I see it too, girl. Abandoned. Let's get out of here. Ugh! What is that smell? OK, Toothless, spark it up. Death Song amber, hammered thin. to stare straight into the eyes of a Flightmare. What's wrong? Did you see something on patrol? OK, now it's my turn. Everyone, quiet. Astrid, is what you found bigger than a yak box? I found a fishing boat. I'm supposed to guess before you tell me. Doesn't anyone know how to play? And just for the record, a boat bigger than a yak box. So I'll just square this one a win for the ol' T Nut. Scratch one off in the Tuffnu-u-t column. It was just drifting out there. We got out of there as fast as we could. Um, Hiccup? Pale, green skin. Wait, back it up. Did he say Scourge of Odin? Yes, but there's no need to panic. Right, no need to panic. The Scourge of Odin. wiping out entire Viking villages! Yeah, why would we worry about that? Quick, Hookfang, I need a mask for my mouth. Well that's a long time coming. Very funny! I already feel short of breath. We must burn our clothes! -Like that's going to cure the Scourge. Once I had a really bad cold, so I decided to eat some mouldy bread. Don't ask me why, because I don't know. But - BOOM! Instantly cured. OK, you scuff now, but one day science will recognise my genius. They called old crazy Uncle Henrick "crazy". He married his own beard! Let's go with your clothes burning plan. We'll keep them on you, just to be sure. Barf, Belch! eat mouldy bread or hyperventilate. Snotlout, you can't catch the Scourge of Odin by breathing. And there hasn't been a single case of the Scourge for centuries! Plus, Astrid got out of there right away. Hiccup? What are you doing here? -You saw that scratch, right? All right, let's assume for a second that you're right. overtaking its victims in less than three moons. -One moon has already passed. Snotlout is on his way back from Berk with Gothi's notes. Hopefully they'll tell us something more. Hey, Astrid, how you feeling? In Gothi's notes there's a cure for the Scourge of Odin! A green solution made from the saliva of a Buffalord Dragon. -There aren't any more Buffalord. They were all hunted to extinction during the Scourge's last outbreak. We don't know if they're gone for sure. We need to get out there and find one. But we don't even know where to start looking! There's no mention of the Buffalord anywhere. It's like they were wiped from history. -What else have we found, Fishlegs? combing through my Dragon Eye research, and found some old notes. The Buffalord! But nothing on its location. There's really not much about it here at all. Well, it's big, has ram-like horns and lives on the plains. no useful information. Just archaic dots and slashes. What? Wait, You guys see something? Yeah, these make a map. Duh! How do you guys not see that? We're experts at interpreting abstract images. Watch and learn. We found it, Hiccup! We found it! Now let's hope to Odin they still exist. Now these dragons were supposedly hunted to extinction. they will have developed a weariness towards humans. Which means we have to move quickly. and bring the cure back to the Edge. I feel ya, bud. But we have to keep pushing forward. and we'll get back up in the air. Not the remnants of any dragon I'm familiar with. And I know my dragon droppings. It's fresh, Hiccup. Last couple of hours. This dragon is still somewhere on this island. And might I add, a very distinctive bouquet. Well, if it's here, I think I might know how we can find it. Now it's not field tested, but it's worth a shot. Now hopefully a dragon this large doesn't move too fast. -It must've taken to the air here. Well, for looking at things close up. Nothing! How could there still be nothing? You guys distract it, and I'll get its saliva. Be careful, Hiccup. We know nothing about this dragon. Oh, what do we do now? We rope him and take him back to Dragon's Edge. Shouldn't be too hard, right? It's remarkably docile for a dragon of its size. No wonder it was so easily hunted. You got to toughen up there, Buff. Aw, he's kind of cute. 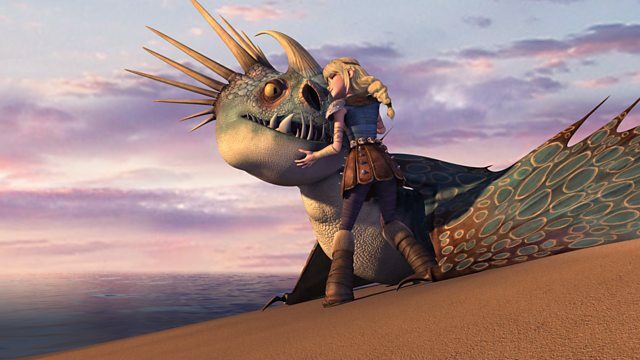 Hiccup, can we keep him? I promise I'll walk him and feed him and stuff. We already know his poop doesn't smell. And he doesn't even act like it! Not like Ruffnut, who acts like her poop doesn't smell. We need to get him back to Astrid. Uh, guys, I think something's up with the Buff. Ah! No! We need to stay with it. We have to get it back to the Edge. I knew I shouldn't have told him to toughen up. OK, what's that all about? He appears to be fine, so long as he's on his island. Bring Astrid to the Buffalord. I'm on it. We're going to beat this, I promise you, Astrid. You just have to keep fighting and hold on. You need to stay with us. All right, we need to move quickly. Maybe it takes some time for the antidote to work? It says the green solution will cure the Scourge. Green solution - cure. That's all it says. But the Buffalord's saliva is clear. What does it mean - green solution? How can you guys eat at a time like this? Hey! People deal with stress differently, OK? hey, who doesn't want sweet-smelling droppings? It's all over my pants. MIXED with its saliva that creates the antidote. it can't be away from the herbs it eats. So we just need it to eat the herbs to create the green solution. Just a little longer, please. You worked up a healthy appetite trying to kill us earlier, so eat. Hello, Hiccup. Thank you so very much for this gift. to save your little friend. But how? There's no trace of this island anywhere. Who cares! We've been dying for a little action. Let's make this count, bud. Hiccup, I can't get a clean shot. Pull up, Riders. We can't risk hurting the Buffalord. Oh, I beg to differ, my dear Hiccup. I'm keenly aware of my actions. This dragon is exceedingly unique. It will illicit a considerable bounty on the open market. You should have left well enough alone, Hiccup. My fishing boat was no place for you or any of your Riders. It's simple, really. Supply and demand. I knew where to get the supply, if I could only generate the demand. I'd have thought you were above name-calling. And what if the dragon was extinct? I tend not to dwell on the what-ifs, my boy. -I would think twice about your actions, Hiccup. Like I said, business is business. This? Oh, it's a loss I'm willing to incur. OK, Viggo. OK, You win. I'm not leaving here without it. That's a loss I'm not willing to take! don't give in. Not for me. Do we have a deal, or are we both leaving here empty-handed? I've truly missed our time together, Hiccup. My brother leaves something to be desired in the repartee department. My boy, don't look so morose. It takes all the fun out of it. All's well that ends well. Hm? I know, I know. Just drink. I'm afraid our time must end, Hiccup. We will continue our contest in due time. He won't get far. Let's go after him! Argh, the beast has been secured in the transport ship. The again, he is a man of his word. Something to admire about that. Release it! Release the beast. Well, that leaves just one thing to do. my mother, and my brothers and my sisters. Where the brave shall live forever. This might be just the beginning. -Something Viggo said about knowing where the supply was. -You don't think he could've unlocked the Dragon Eye, do you? He doesn't have a Snow Wraith key. But he found the Buffalord on his own. And we need to find out how. Hiccup, I just wanted to say thanks. It's no big deal. You'd have done the same for me. I can't imagine a world without you in it, either.